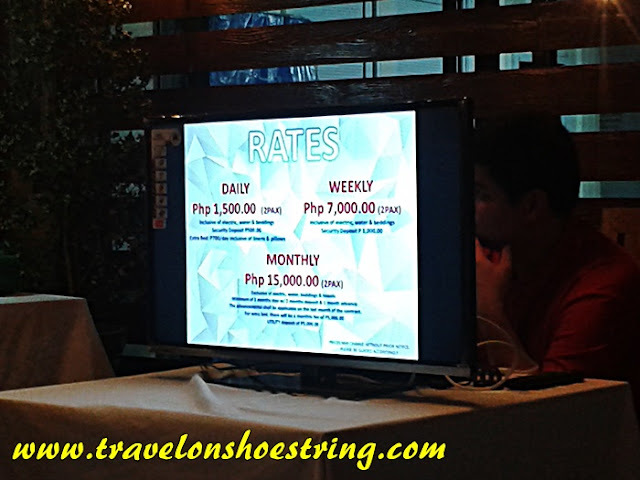 Travelling on a shoestring? When in Makati in the Philippines with budget constraints, you don't need to worry anymore, smile and be happy! Why? It is because Makati City is the home of the latest hometel in town! 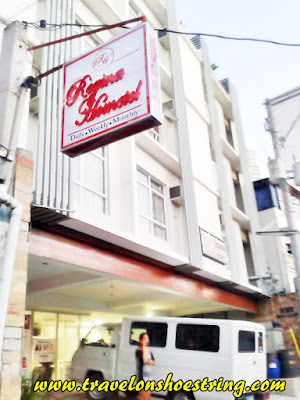 You can now avail of the "Swak sa Budget" offerings of Regina Hometel at 7272 J. Victor Street, Pio del Pilar, Makati, Luzon 1230, Philippines. 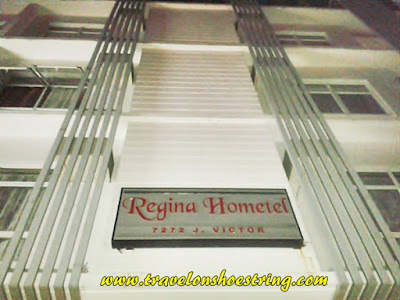 The #ReginaHometel, your #HOME in the City is one of the newest places to discover whether you are a backpacker like me, a tourist on vacation, a balikbayan, a foreigner on a business trip or a family who wants to have a staycation not far away from your HOME. 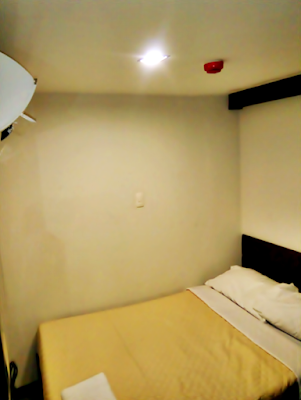 This “Hometel” combines the comfort, affordability and the world renown Filipino hospitality and service oriented mindset of its all-Filipino staff. Strategically located around offices, malls and other establishment for your personal or business needs. Best place for an overnight stay if you get caught and got really tired of the traffic in the city. 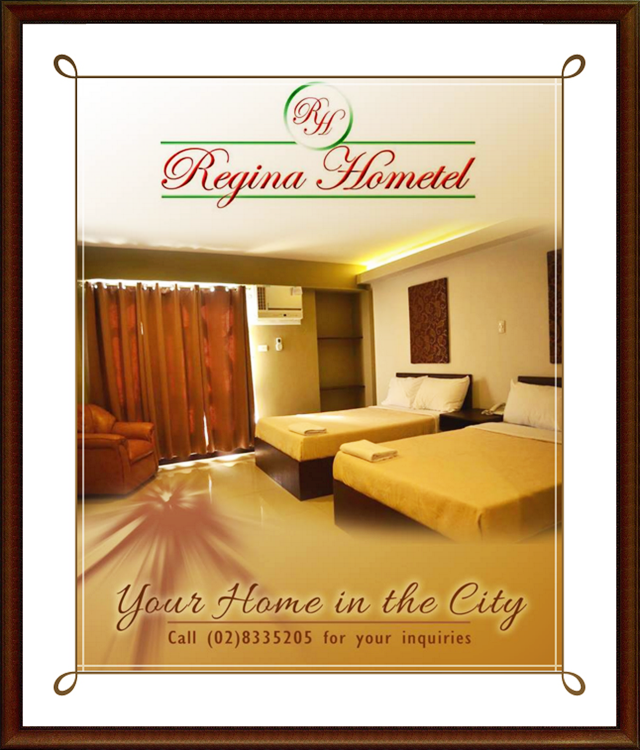 Just a few steps away from Waltermart and Makati Cinema Square. It is just a jeepney ride away from Glorietta and Greenbelt Malls. 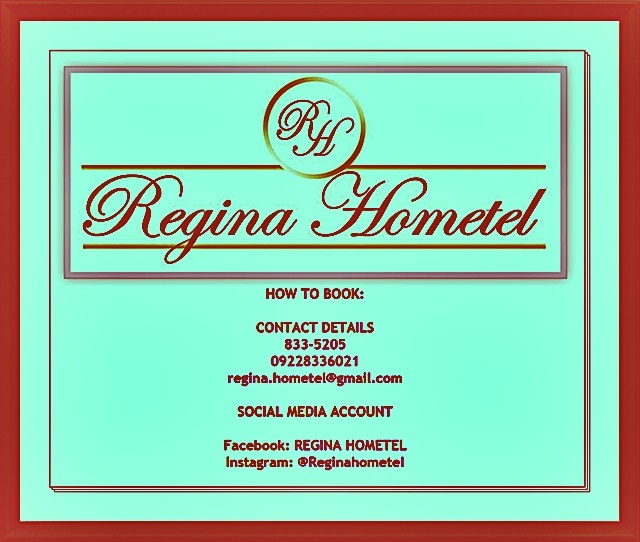 Since Regina Hometel is also within the reach of gimmick/party places, you may also make a wise decision of staying over after getting tipsy/drunk rather than driving home. You better be safe than sorry. 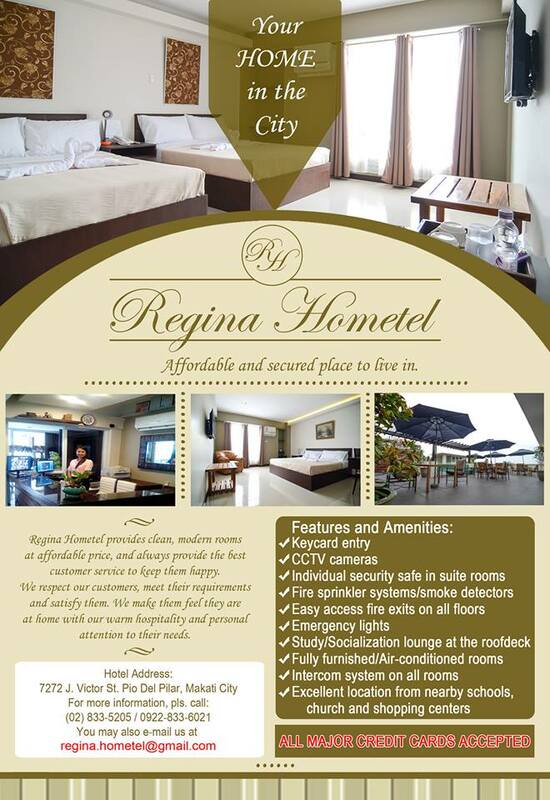 At Regina Hometel you have an option to choose from different room types, available 24 hours a day. Inclusive of electricity, water and beddings. Security Deposit of Php 500.00. 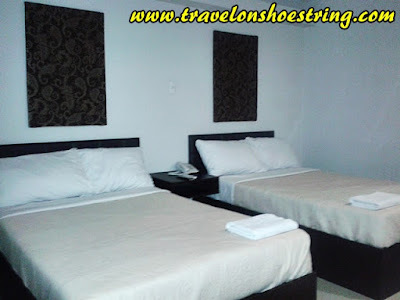 Extra Bed: Php 700.00/day inclusive of linens and pillows. Exclusive of electricity, water, beddings and towels. 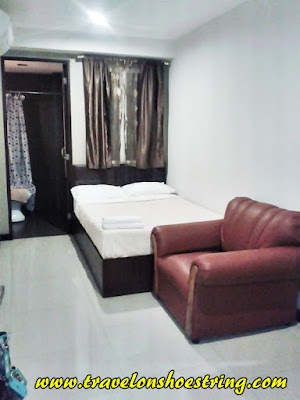 Minimum of 3 months stay with 2 months deposit and 1 month advance. The advance rental shall be applicable on the last month of the contract. You're paying a low low price for a premium location! 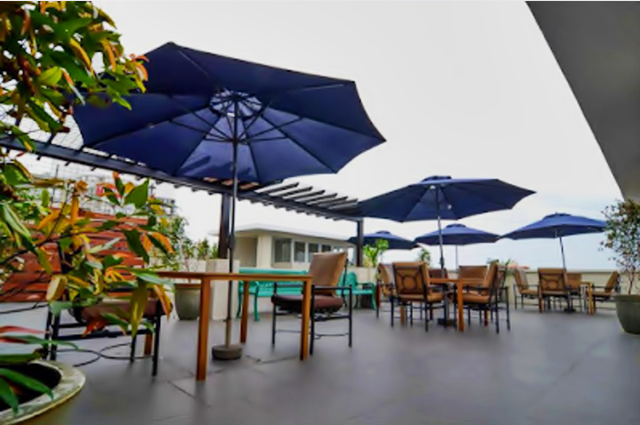 It is conveniently located in Makati and has a close proximity to schools, churches, hospitals, businesses, gimmick places and shopping centers. Regina hometel's rooftop is open for booking for small functions, seminars and gatherings for a very low rental rate of PHP 5,000.00 good for 6 hours ( Inclusive of tables and chairs). It has a covered rooftop so you and your friends will be comfortable. Rest assured that you'll be safe from the glaring sun or sudden rainfall during your event or celebration. Just tell them you read it from my blog! Who knows, they might give you a one peso discount, ha ha ha! Joke! Smile! Happy New Year everyone!